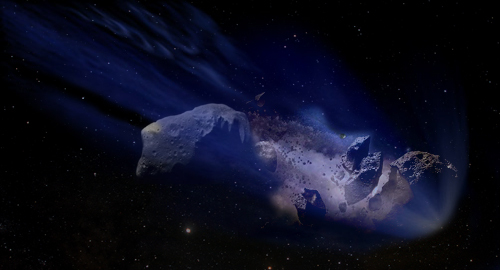 The giant impact moon theory involves such a collision, which some have attributed to a planet called Theia which is proposed to have fallen out of its orbit in the outer solar-system ( see: Theia ). The recent developments in evidence of water on the moon shed doubt, however, on an impact as the process which created it. Other independent thinkers have developed separate theories, like Lloyd Pye, who proposed that a planet called Nibiru hit the earth, creating tectonic plates, the asteriod belt and the moon etc. But the problem that I find with all of this is something which I have touched on in the notes on my approach to this website and theory ( see: About This Site ). It seems, and with all due respect, that they are quite 'straight' in their thinking. What I'm getting at can be exemplified by the general assumption behind these theories - that the impactor must have come randomly from deep space or elsewhere in the outer solar-system because there is 'simply nowhere else for it to come from'. I think there may be somewhere else for it to come from.